Jim, a Saskatchewan farmer, was unhappy with the establishment of his barley crop — he had expected a more uniform stand. When he contacted me the first week of June last year, Jim said plant populations in some areas of the field were thin, while others were thick and lush. The plants, which were at the four- to five-leaf stage, began showing symptoms at emergence. At Jim’s farm, I noticed some areas of the barley field had thin plant stands while others were well established. On the headlands, the plant stands were thick. However, next to the headlands some areas had thin plant stands. It was interesting that these thin plant stands occurred in clearly demarcated rectangular blocks. And next to those blocks, moving away from the headlands, were normal, healthy plant stands. 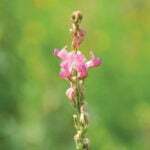 Additionally, the plant stands on hill slopes and some hilltops were thin, while those in low-lying areas were thick and well established. The rectangular blocks with low plant densities were narrower than the width of the seeder. It was possible there were a number of issues affecting plant establishment in the barley field. Jim had some theories: since his fertilizer rate was correct and he had a good fertility and placement program, he thought the thin plant stands may have been caused by insects, moisture stress or seedling disease. The rectangular blocks with low plant densities were narrower than the width of the seeder. I checked seeding depth and I examined fertilizer rates and placement. I also confirmed Jim had used fungicide seed treatment on the barley in addition to examining the plants for signs of disease. I also scouted for cutworms and wireworms, which can cause thin plant stands. However, I found no evidence that seeding depth, fertilizer rates or placement, disease, or insects were to blame for the emergence issues. It had been a dry year so far, and emergence was poor across many fields in the area. It was plain to see drought was affecting emergence in some areas of Jim’s field, such as slopes and hilltops, and was related to topography and moisture stress. However, this didn’t explain the rectangular blocks of thin plant stands. What was going on here? 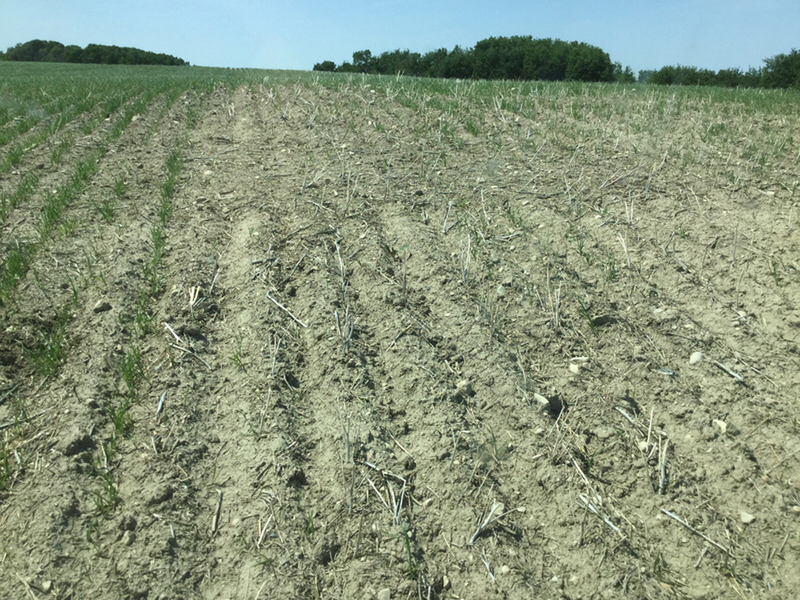 After eliminating emergence issues caused by incorrect fertilizer rates or placement, insect damage and disease, the geometric appearance of the affected areas could only be caused by a seeder malfunction. Jim said he’d had some problems with his seeding equipment, but he thought he’d addressed them. However, only a seeder malfunction could make rectangles with such straight lines and dimensions. Also, the presence of thick, well-established rows next to thin, poorly-established ones supported the seeder malfunction diagnosis. Fertilizer injury, insect damage and disease wouldn’t cause such a clear distinction between affected and unaffected areas. The rectangular shape of the thin plant stand patches immediately indicated something other than a natural cause was at work here. The thin plant stands located on hilltops and hill slopes were caused by moisture stress and were related to topography and the dry conditions the region was experiencing. 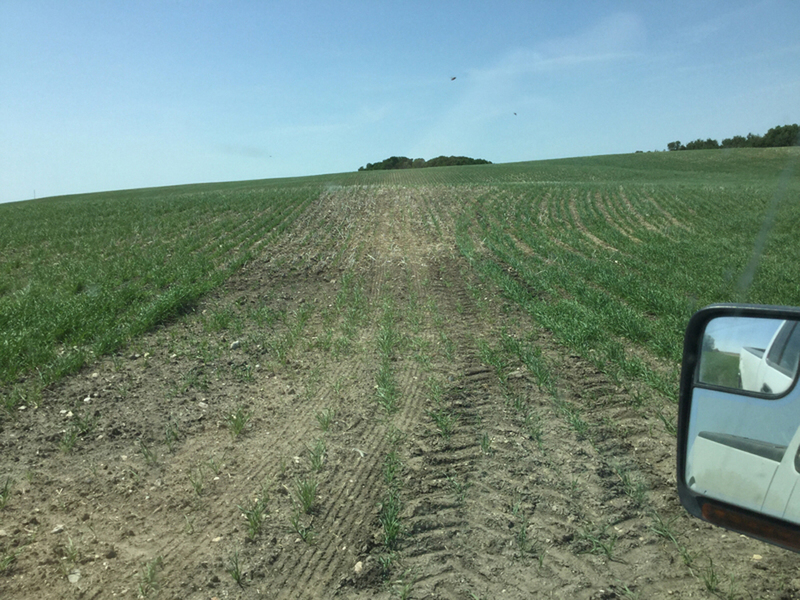 Thus, Jim had a couple of issues causing thin plant stands in this barley field: moisture stress on the hilltops and slopes and a seeder malfunction where the rectangular blocks occurred. Jim went back over his seed drill and found the cause of the malfunction. The manifold for seed distribution on the drill wasn’t working correctly. Thus, more seed was flowing to other parts of the drill — seeding heavier in those instances — and reducing seed distribution on the sections with poor stand establishment. 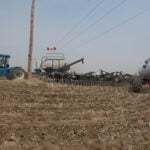 This issue was likely limited to one or two sections of the drill, which is the reason for the rectangular block patterns that were narrower than the width of the seeder. Jim had the machinery repaired so that he’d be ready for the next season. Yield at harvest was lower in the areas with thin plant populations, but overall the field did better than Jim expected taking into consideration the moisture the field received that year. 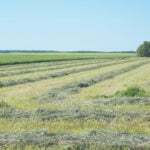 Less than five acres were affected by the seeder malfunction. Remember to check your seeding equipment throughout the planting season. 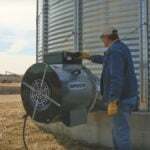 Sometimes an issue is hard to spot until it’s too late to fix for that season, but, if caught in time, the equipment will be ready for the next one. 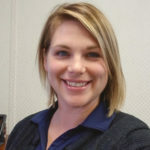 Amber Bernauer, BSc (Ag), AAg, works for Richardson Pioneer Ltd. at the Dixon location near Humboldt, Sask.